Easily attach this cupholder on either side of any stroller to fit small or extra large drinks. Use the netting surrounding the outside to store the things you need to access quickly such as your cell phone, keys, pacifiers, etc. 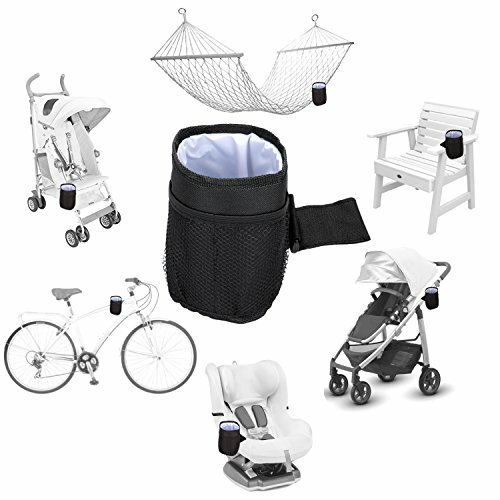 You can even leave this cupholder on your stroller when you fold and unfold it, just make sure to remove your drink out of course! Makes a great baby shower gift! Easy to attach and fits any single or double stroller and all convertible car seats or booster seats! Fits any size cup or bottle. Securely holds onto your drink, even when hit or bumped. Folds with your stroller so you don't have to remove it. Extra netting surrounding the outside for extra storage for keys, cell phone, pacifiers, etc. If you have any questions about this product by Luvit LLC, contact us by completing and submitting the form below. If you are looking for a specif part number, please include it with your message.